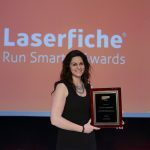 Laserfiche has announced the winners of its annual Run Smarter® Awards program, including two non-profit organizations. The Arrowhead Economic Opportunity Agency (AEOA) was incorporated in 1965 as a Community Action Program for counties in northeast Minnesota. Currently, AEOA employs more than 350 full- and part-time staff and uses more than a thousand volunteers divided among five major departments. The Head Start department uses Laserfiche Mobile to provide direct service field staff with instant access to digital case files containing as many as 32,000 scanned pieces of paper. “Laserfiche Mobile has benefited both our Head Start staff as well as Head Start parents. Our program has seen a huge time savings for both administrative staff and direct service field staff through the use of Laserfiche Mobile,” said Lori Trenholm, Information Systems Manager at AEOA.